In 2008 I was desperate to lose some weight and get my fitness levels up. I’d grown to a near massive 20 stone and knew I had to change my ways quickly. Having good facilities at work I decided to commute on my heavy old mountain bike and soon realized I had to upgrade. A close friend had recently got back into cycling and he convinced me that I should buy a road bike so I took the plunge and immediately loved it. I started to watch my friend riding at the local track league and also enjoyed watching the Beijing Olympics. I knew then that I wanted to give track racing a go, I also realised that I couldn’t do it alone and was therefore was recommended to Lee Povey. I met with Lee in October 2009 and we sat down to discuss what I wanted to gain from cycling and what I aimed to achieve. 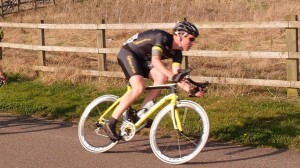 At this point I wanted to get to a weight which I could race at and be competitive in the local track league. Lee instantly made me feel comfortable and he was positive in his outlook towards me. Lee set me up with a tough winter training program and helped me with my diet to shed the weight and to improve my fitness. 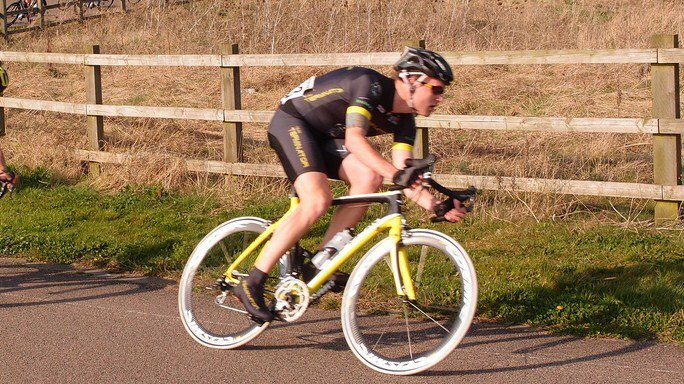 I had my first ever race experience at the Hillingdon winter series (road racing) and took a real pasting but Lee carried on encouraging me and assured me things would improve and he was right, by the end of the winter series I was finishing comfortably within the group. I took confidence from being able to do this and I knew that it would benefit me when the track season started. By the time the track season started I had lost 5 stone and after only 3 weeks in the “B” league at Preston Park I was topping the table and therefore promoted to the “A” league. This was already a massive achievement for me and I had reached my 2 goals much earlier than I thought possible. I finished my first season in a respectable 12th Position in the “A’ league and had also gained enough points to be promoted from a 4th Cat to a 3rd Cat rider on the road. Lee’s constant praise and encouragement really did spur me on to train as hard as I could and in turn lose the weight that I was carrying. In one season with Lee coaching me I have gone from being 20 stone and doing very little exercise, to having lost 5 stone and training/competing 6 times a week. I have also exceeded all of my racing expectations and am sure that with Lee’s guidance I will continue to do so. I’m really looking forward to working with Lee in the future and surpassing what I’ve achieved already this season.